Streptocarpella saxorum has wonderful cultivars and is one of my favorite plants. It has cute, velvety, deep-green leaves, and dainty flowers that hang from long stems and almost look like a cloud of butterflies flocking around the plant. There are may cultivars, one of the most common of which is Concord Blue. The different varieties available vary in the size of the flowers and the shade of blue from violet to deeper blue, light and darker blue. There are also white cultivars. Some are purely white, others are very pale blue or are white with fringes of blue. There are also variegated forms, though I don’t know how well those bloom. The wild form is somewhat smaller leaved, more of a lavender flower color, and I am still waiting to see how well it blooms (it’s almost blooming size). So far it seems to me to be a shy bloomer. The commonly sold cultivars are heavy bloomers and put on a wonderful display. Streptocarpella saxorum originates from Tanzania and Kenya. It a tropical plant though it seem to enjoy cooler environment around the low 70ies Fahrenheit. This plant is very frost sensitive. It belongs to the Gesneariad family and is an African violet relative, even called false African violet. The growing conditions are almost the same as for African violets. This plant grows to about 12 inches in height and makes a wonderful hanging basket plant. Once it reaches a decent size this plant is ever blooming. This plant likes to dry out a bit between watering and likes to be occasionally soaked. Be careful of over-watering. The plant has juicy stems that tend to easily rot if the soil is soggy. If your plant is young and tiny you can be more generous with the watering, but a well established plant benefits from having its soil dry up between watering, especially in the winter months. Bright indirect light is perfect for this plant. It likes part shade to shade. A large unobstructed north facing window , or an east/west window will be ideal for this plant. Direct midday light will burn the leaves. This plant enjoys higher humidity levels, but do not spray the leaves as it will result in wilt spots. On another note this plant also seems to enjoy cooler environment, so lower temperatures and plenty of moisture in the air will help making your plant thrive. I use a mix of general potting soil and African violet soil with plenty of per-lite to make the soil well drained and light. This plant like basic to slightly acidic soil, well drained and light. I use African violet fertilizer during the warmer months, at a lower concentration than the recommended. Overall this isn’t a very fussy plant. Streptocarpellas ca be propagated by cuttings, from offshoots or seeds. You can even propagate them from a leaf. Cuttings root well in both water and moist soil. Generally speaking this is a very easy to propagate plant. When propagating from cuttings it helps to keep the humidity high, but keep the leafy part of your cutting from any water droplets as it will rot. Streptocarpellas seems to do better kept in a cooler place. From my personal observations it seems to flower better when the temperatures are a bit on the low side. Pruning disrupts the flowering, but sometimes its needed. Cleaning the old leaves / spent flowers and occasionally pinching off a leggy stem will keep your plant looking good. It can suffer from mealy bugs, and aphids (those seem to only go for the flowers). Spraying with insecticide will make the leaves get spotted and eventually dry off, so my advice would be to remove as much of the infected plant, simply cut off as much as you can back, remove overly infested leaves and then spray out plant. Passiflora periesii is one of the many wonderful everblooming passiflora varieties. They all more or less require the same conditions, though some are more needy than others. Passiflora periesii is a large showy passiflora. The flowers only last a day and they tend to open consecutively along the stem. When your plant gets large enough, it will be continuously covered with flowers. The higher the light/heat/humidity/soil richness the more you will get out of your plant. This plant requires room and support to climb on. Extremely showy and very rewarding to grow. Even thought each flower last a day, it makes such a beautiful sight to see. The flowers are such an intense bright red color, they almost seem to glow. They are also very large and look almost unreal. Water when the plant when the soil approaches dryness. If the temperatures are high, water the plant more generously. Passionflowers generally like a lot of sun, heat, water, fertilizer and humidity. Pretty much a lot of everything. During the winter reduce the amount of water appropriately. You can find more information and tips on watering here. The more the better! Passiflora piresii will flower on an east or west window, but it will do the best on a south facing window. The picture on the right shows Passiflora piressi flowering on a small east facing window. If you have the opportunity, grow it outside in full sun during the warmer months. Supplementing it with grow lights during the winter will help to get more growth and flowers during these dark times. If I had southeast floor to ceiling corner windows (the next best thing after an actual greenhouse) I would have tons of ever blooming passionflowers! This plant prefers higher humidity, though will tolerate lower as well. If the humidity is too low the corners of the leaves will dry up, and the flower buds may fail to open. You can read more about humidity and tips to maintain it here. Passionflowers like rich soil mixes, neutral to slightly acidic, that are freely draining. Some varieties can tolerate a wide range of soil conditions, others are more fussy. When I re-pot my passifloras in the spring I like to mix in general potting mix with some peat moss and a bit of fully composted cow manure to get the pH slightly up and add plenty of organic richness to the soil. I also add perlite or sand to insure the soil is freely draining. Generic fertilizer applied at half strength regularly throughout the growing season seems to do the job. If the plant leaves turn paler, the plant is either not getting enough nutrient, not enough light, or is missing minerals. Can be easily propagated though cuttings or seeds. Cuttings is preferable as the plant will come into flower as soon as it gets big enough. If you grow your plant from seeds it may be years before your plant matures enough to start flowering. This is a large leafed vine with big flowers that requires quite a bit of support. Shaping pruning and wrapping back onto the trellis is essential to keep this plant in a good shape, well branched and looking good. The higher the light the better. It’s interesting how the plant forms buds up along the branches in a way that would allow the flowers to open one a day. The leaves are big and darker green, beautifully contrasting the flowers. Passiflora piresii flowers don’t have a sent. Seemannia sylvatica, formerly known as Gloxinia sylvatica, is a wonderful house plant to have. A rapid grower, it quickly fills up a pot and flowers heavily and constantly. This plant belongs to the gesneriad family and originates from South America. It produces rhizomes and if worst comes to worst, your plant gets exposed to the cold or gets dried out, you can bring it back to life, as long as there is a fragment of a healthy rhizome in the soil. This plant grows offshoots and fills up the pot completely in a very short period of time, so I wouldn’t recommend it for mixed containers or arrangements. Some cultivars like ‘Bolivian Sunset’ are quite large, a lot more enduring and better suited for outdoor cultivation. Seemannia medea looks almost identical to Bolivian Sunset and it grows quite tall with firmer taller stems, larger longer leaves and slightly larger flowers. There are many different cultivars as well as an yellow form of the plant. The one I have is closer to what is found in nature. It’s a small stature plant, seldom growing more than 6-7 inches in height (mine stays around 5 inches tall when provided with lots of bright indirect light), quickly filling up the space in a pot by growing a network of rhizomes and many offshoots. This plant is a pleasure to have. It has gorgeous unique blooms that really catch the eye, and you are sure to get many compliments on it. It’s very easy to grow, and even if something goes wrong, or you forget to water it, it can quickly recover. Seemannia sylvatica likes plenty of water and can even tolerate sitting in a tray full of water. In fact, I do that sometimes on a hot day. This plant takes in quite a bit of water. Nevertheless, don’t let it soak in water for days, as it will most definitely rot. If you dry it out, it can re-sprout from its rhizomes, but overwatering it might rot the rhyzomes and there is no recovery from that. Just observe the leaves. Sometimes you will water it just to find the leaves going limp several hours later, so you simply have to water it with more water. Significantly cut down on the watering during the winter months. Seemannia sylvatica grows the best with a hygrolon strip through the soil and a water reservoir, passively maintaining the soil at the perfect level of moisture. You can chose to let it “die” for the winter by placing it in a slightly colder, darker place and significantly reducing the watering. Once you start watering the plant in the spring time it will re-sprout. This plant can adapt to a range of light conditions. If you grow it at low light it will get leggy but still flower. Indoors east and west windows are ideal. In my experience, you get the best results from very bright indirect light. Such as north facing garden window with no obstructions, where the plant gets bright light from all directions, but no direct light, or outside on the north side of the house, with couple of hours of direct sunlight, no noon light and plenty of bright indirect light. You can slowly accustom your seemannia to full light as well, but it has to be done very, very gradually otherwise you will burn the leaves. Seemannia sylvatica likes higher humidity. If the humidity is too low the tips of its leaves will dry out, and it will not look as pretty. The leaves are somewhat ‘hairy”, so spraying on them directly will result in blotches and spots, even holes. A tray with water and rocks under the pot, so that the plant is not soaking in water, is a great way to keep the relative humidity around the plant high. You can read more about humidity and tips on how to maintain it here. I personally use African violet soil mixed with regular potting soil and lots of perlite. You can make your own mix as well (regular soil, peat moss, a bit of lime and perlite). This plant is not that needy, though it really helps to have the soil be light and puffy and well drained. I use African violet fertilizer for this plant, though a generic, well balanced fertilizer will do the job as well. Fertilize from spring to fall every now and then, preferably at a lower than the recommended concentration, but more often that recommended. Seemannia sylvatica is extremely easy to propagate. It rapidly grows offshoots and you can simply dig one out. You can technically root a cutting as well, or dig out a piece of rhizome and plant that. Many options there, though offshoots are the easiest and fastest way to propagate it. This plant grows to a nice dense specimen and you can simply split it into two good sized, covered in flower plants. I still get surprised when I go to re-pot a well grown Seemannia sylvatica and I lift the plant from the pot. Where did the soil go? It almost seems all the soil was converted into roots and rhizomes. And any piece of rhizome can be used to grow a plant. I absolutely love this plant. I really like the flowers on it. Those furry red bells with spotted yellow inside are so gorgeous and cheerful. The overall growth habit of this plant is so lovely. I prefer it over the Bolivian Sunset form, as it stays more compact. It’s definitely a must have plant. I would even say that this is a great beginner plant. An interesting observation that I’ve made is that this plant likes to fill up a pot with its rhizomes and then offshoots, before it starts flowering. However, if you take out a flowering offshoot and start you plant from there, it will remain flowering while growing its rhizome network and offshoots. Episcia ‘Pink Panther’ is a lovely showy plant, that gets covered with pink blooms. 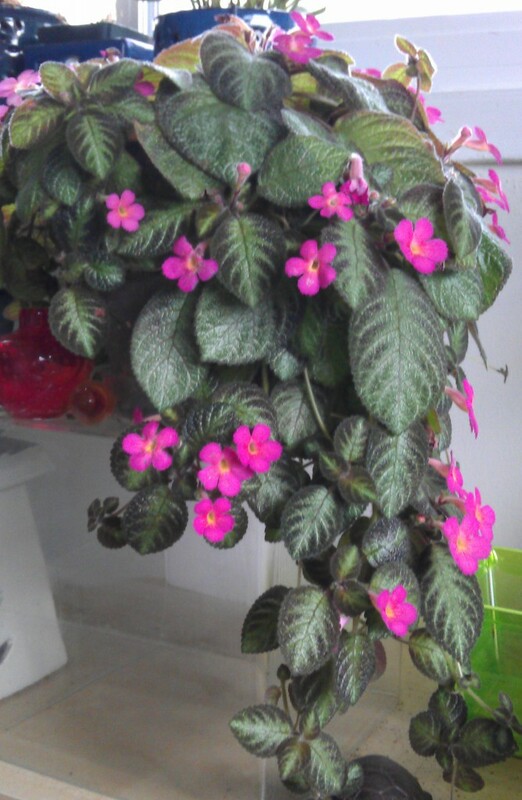 All episcia have very similar growing requirements. Most episcias are Episcia cupreata cultivars or hybrids. Some varieties are more needy, some bloom constantly, others were selected for foliage alone and seldom bloom. Some have large leaves and turn into big showy plants, other are miniatures. They have cute flowers with intriguing shape and fuzzy leaves, though some cultivars have glossy leaves. Pink Panther has a gorgeous fuzzy foliage, and is a constant heavy boomer. It has medium size leaves and rapidly grows to fill a pot. Great plant for hanging baskets, and absolutely lovely to have in your room! The plant in these photos is grown in my bedroom about 3 feet from a somewhat small east facing window and under a north facing window. Most of the flowers are towards the north facing window, though as you can see quite a few of them are facing east and make quite a gorgeous display as soon as you enter the room. Originally a ground cover plant from Central and South America, episcias have been extensively grown, hybridized and selected for foliage and flowers, and make wonderful house plants. Water when the soil gets a bit dryer to avoid root rot. These plants are very easy to grow and have few requirements. They are related to the African violets and prefer bottom watering. These plants like to get soaked in water and then left to dry out more so than watering from the top. Watering from the top also makes the soil compress more and makes it harder for the episcia to root its stolons, hence making it more leggy and less pretty. Since the leaves are hairy you don’t want to get any water on them and risk the leaves to rot. These do great with a hygrolon strip through the soil and a water reservoir on the bottom as a passive watering setup. This also keeps the soil light and prevents clumping. Part shade to shade. Episcias are relatively low light plants. They will do best with bright indirect light. Large unobstructed north facing window, or any east/west facing window. I’ve also grown them some distance from the window. They will flower as long as there is decent amount of light. You can also grow them under grow lights. South facing windows are not good for those plants, and the strong sun will burn the leaves, unless you very, very slowly get your plant adapted to the high light levels. These plants like high humidity, though they don’t like their leaves to be sprayed directly. Having a tray with water and rocks, so that the plant pot stays above the water and is not soaking in it, is a great way to keep higher relative humidity around your episcia. Another way to make sure the humidity is higher is to grow it next to plants that do like to be sprayed. ‘Pink panther’ is not a very needy cultivar, and doesn’t require as much humidity or warmth as other episcias to thrive. I grow my episcias in african violet soil with some generic soil added to it, as well as a good amount of perlite. You can also make you own mix with regular soil, peat moss for acidity, and per-lite/vermiculite. These plants like light, fluffy, somewhat acidic soil. I sometime add charcoal and/or orchid bark at the bottom of the pot for an even better drainage. I use African violet fertilizer for these plants, at a lot lower than the recommended concentration once a week, spring to fall. These plants are exceptionally easy to propagate. Cuttings and stolons are very easy to root, you can even root a leaf. I like to add moist soil in a zip lock bag and plant my episcia cuttings in there. You can also bend the stem and plant the stolons (while still an intact part of the plant) in the same pot. Pink panther is quite a heavy bloomer. This variety is very showy and is a relatively low light flowering plant. Trimming and regularly removing big old and damaged leaves and spent flowers will help maintain the plant looking its best. When re-potting the plant it helps after removing all the big old leaves to bend the stems and pot the stolons into the same pot. That will help make your plant get denser and more gorgeous as well as propagate it (you will have those stolons rooted and can always split your plant next time you re-pot it). Plumbago auriculata, commonly known as just Plumbago or Leadwort, is an ever blooming tropical shrub, that can be pruned and maintained at a desired size. Left to grow outside, it can reach 6 to 10ft in height, but remains much smaller when grown as a houseplant. In fact the plumbagos I have are constantly kept under 3 feet, and they don’t seem to mind it at all. There are many cultivars out there for sale, some are smaller, some are white flowered or deeper blue flowered, though not all are year round bloomers. The one I have experience with is the Royal Plumbago (Plumbago auriculata ‘Monott’). It’s constantly covered with flowers. I grew it on an east facing window during the winter, as well as obscured west facing window, and it was flowering all throughout the winter months without a problem. One thing that can disturb the heavy blooming for some time is heavy pruning. Nevertheless, this plant does benefit from pruning. It not only helps maintain the desired shape and size, but it also makes the plant denser and helps it bloom heavier. The plumbago mostly blooms from the tips of its branches. 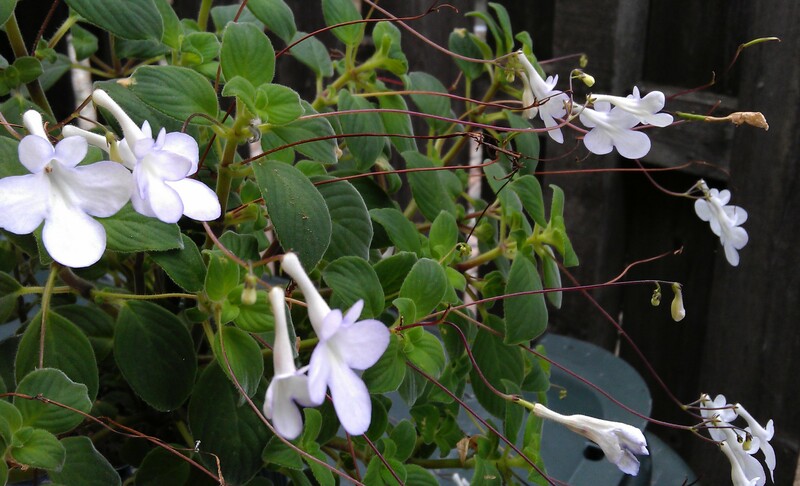 This plant has gorgeous sky blue flowers and small light green leaves, making it look angelic. It’s also very easy to grow! The Plumbago can tolerate some drought. It does like to have its soil dry out between watering, especially in the winter months. You can read more about watering here. The higher the better, though this plant will still grow and flower at a part shade location. East/west/south windows will do best for this plant. I would recommend taking it outside at full sun during the warmer months. Remember to do that gradually. Taking your plant from the windowsill directly to full sun will burn the leaves. Flowers are a bit paler in color when the light levels are lower. They do tend to get darker as the flowers age. This plant can tolerate lower humidity levels, but seems to do better at higher humidity level, so occasional spraying will help out. In fact spraying the plant, especially during the winter months, seems to really help with flower production! Neutral to slightly acidic pH soil will do best for this plant. If the leaves start turning yellow, perhaps the pH of the soil is too high or your plant doesn’t have enough manganese. I use generic fertilizer from spring to fall at a lower than the recommended concentration. I haven’t been successful at rooting cuttings, though I have seen people mentioning it as a way to propagate this plant. Luckily it grows offshoots that can just be split of during re-potting. I will be trying out air-layering as I think it will definitely work out with this plant and I will let you know how it goes. Pruning and shaping the plant is needed as it tends to grow long leggy stems that start hanging low. This can definitely be trained to grow more upright or even grown in a hanging basket. It’s a wonderful plant and I highly recommend it. As the flowers age they tend to turn a bit darker shade of blue which is quite beautiful. Another thing about this plant is that it will require a bit of clean up. Dried and old leaves around the stem and old flowers can make a bit of a mess, so regularly picking those off will help out. Calliandra emarginata is a gorgeous ever blooming plant. It’s a dwarf shrub and can be shaped, pruned and maintained at a smaller size. It can grow up to 3-4′. This is one of my favorite plants! It’s always covered with beautiful and dainty powder-puff flowers. The color is deep pink, almost red, and it seems to depend on the amount of light the plant is getting. Winter time the flowers are lighter pink in color, but nevertheless there is an abundance of them. This plant will flower even at low light levels. The best results however come from high light conditions. Calliandra emarginata originates from the region of southern Mexico, Panama and Bolivia (Zone 10+) . It belongs to the mimosa family. When the sun goes down in the evening, or if there isn’t enough light, the leaves of the plant will fold in. Do not mistake that for a sign of your plant being under-watered. This plant has medium watering requirements and seems to like drying out slightly between watering. I do have a hygrolon strip though the soil and a reservoir of water for it, and it seems to do really well with that watering set up as well (I will post more about hygrolon soon). Let the soil dry out more between watering it in the winter, to keep a healthier root system, though in the summer you can virtually have the soil moist all the time. High light will do best for this plant. I grow this outside in full sun in the summer, and on a western/eastern windowsill during the colder months. It could be grown year round on an east/west/south windowsill. Keep in mind that the size of your windows and weather there are any obstructions matters. So a very large eastern window with plenty of light and no obstructions casting shadows on your plants will be better than a small southern window facing a building. I have also used daylight LED during the winter months and this plant grows really well under that type of light. Granted, there are more efficient systems which only use red and blue spectrum light, however I am really happy with the daylight LEDs as well. They are close enough spectrum-wise, the prices are going down, very easy to find in any store, and there are plenty of lumens/ Watts. I can also tell the plant is liking it, since it is growing and blooming towards the daylight lamps, and its leaves remain open if I leave the lights on (the leaves fold down when it’s dark). This plants enjoys humidity, so spraying it regularly (especially in the winter when it’s dryer) will help the foliage look its best, and reduce the risk of getting spider mites and mealy bugs. Humidity of 50% and up is ideal, though as long as you are not at risk of getting bugs on your plant, lower humidity levels won’t harm it. I use a mix of regular gardening soil and cactus/citrus soil. I also like to add bark/perlite or sand for better drainage of the soil. I have not noticed anything specific when it comes to soil requirement for this plant. I use a regular fertilizer during the spring and fall. This plant has low to moderate fertilizer requirements. It’s always better to fertilize at a lower than the recommended concentration, then to use a high concentration of fertilizer. High amounts of fertilizer can burn the root system. A generic balanced fertilizer will do just fine for this plant. I have successfully managed to propagate this plant through cuttings, though that was a bit harder than for other species that can be propagated this way. I recommend planting the cuttings in moist soil, and keeping the humidity high. For some reason the newly formed roots are very fragile, compared to other plants, and are easily broken off, so you should be very careful when re-potting the newly rooted cuttings. This plant also makes seeds pods, I have just planed a few and will see how much time it takes for them to sprout and reach a blooming size. Based on what I’ve read, propagating this plant through seeds should be very easy. extremely rewarding to have. Pruning will help keep the growth dense and you can shape your plant however you like. Re-potting should be done when the plant gets root-bound. I highly recommend this plant! It can be trained into a bonsai, or grown as a shrub on a windowsill, or trained as a small tree. Besides the beautiful never ending array of flowers, the leaves of this plant are quite attractive. The new growth is orange in color, adding to the beauty of this plant.